Hudson – Murray A. “Skip” Buchanan, 87, passed away at home, surrounded by his loving family, Friday, Dec. 23, 2016 after an illness. He was born in Boston, the son of Leland and Violet (Arnold) Buchanan, and had lived most of his life in Hudson. He leaves his loving wife of 60 years, Diane C. (Allen) Buchanan; four children, JulieAnn Kaczor and her husband Edward of Leominster, Jodie Ann Coughlin and her husband Jack of North Attleboro, Stephen M. Buchanan and his wife Judy of Bolton, and Marie O’Leary and her husband Kenneth of Hudson; his sister, Bessy Mae McMenemy of Northborough; 11 grandchildren; seven great-grandchildren; and nieces and nephews. Skip served his country in the U.S. Navy during the Korean Conflict. He was a salesman for 29 years with Snap-On-Tools before he retired. 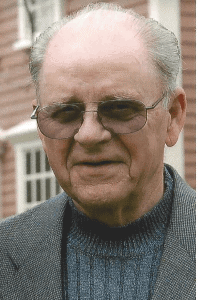 He was a former member of Christ the King Church and a current member of St. Michael’s Church, and was also a life member of the local Hudson-Concord B.P.O.E Elks for 55 years. He was an avid golfer who played weekly with the Parker Group on the Juniper Golf Course. Skip was an honest, straight-forward, hardworking man, loving husband, father, grandpa, good friend, and an all-around good man. Calling hours for Skip will be held Tuesday, Dec. 27, from 5-7 p.m., in the Tighe Hamilton Funeral Home, 50 Central St., Hudson. Funeral services will be held from the funeral home Wednesday, Dec. 28, with a 9 a.m. Mass of Christian Burial in St. Michael’s Church, 21 Manning St., Hudson. Burial will follow at Forestvale Cemetery in Hudson. In lieu of flowers, memorial contributions may be made to the Alzheimer’s Association, Massachusetts/New Hampshire Chapter, 480 Pleasant St., Watertown, MA 02472, or Ascend Hospice, 100 Locke Dr., Marlborough, MA 01752.